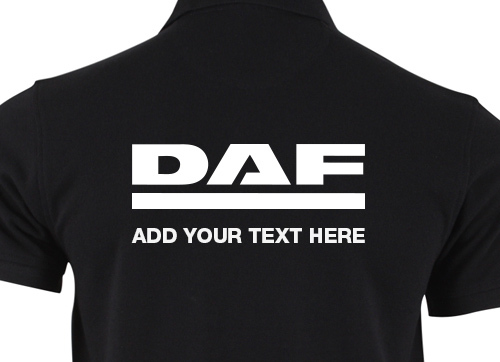 All of our clothing lines are branded with the DAF logo. They are either embroidered with silk cotton, or screen printed in the colour and position already specified. Would you like to add another logo, your dealership, or event name? Perhaps you would like to personalise your team’s workwear with their names? Whatever you have in mind, call our DAF Collection team on 01844 268382, who will be happy to discuss it further. Alternatively, you can email Jim.Davies@DAFCollection.co.uk with your query, who will get back to you swiftly.